For the past few years, Mario Bonello has been on the verge of retirement. Each year, Malta’s most successful male athlete ever, goes into competition in the belief that it will be his final season before ultimately changing his mind. Indeed, this year Bonello has been more than competitive: he has been the best. It is a status reflected by the MAAA’s decision to choose him as the man to represent Malta at the European Athletics Championships that kick off today. 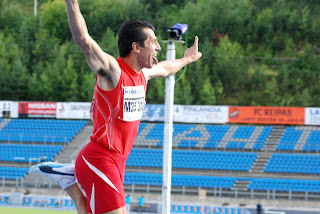 Despite the elation at being chosen to represent Malta at a major championship after a gap of ten years – excluding the Mediterranean and Small Nations’ Games, the last time Bonello took part in a continental competition was the Sydney Olympic games back in the year 2000 – there is still more than a tinge of concern that local athletics can’t produce anyone capable of bettering the results of a thirty-six year old. And there can be no better example than Bonello himself. 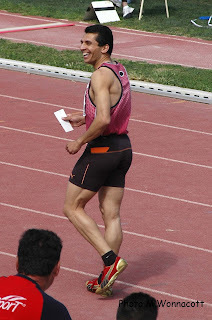 For him, this will be the second trip abroad in as many weeks having earlier taken part in European Masters Championships in Nyiregyhaza, Hungary, winning gold in the 100m. This article initially appeared on the Times of Malta of the 27th July 2010.